Cristiano Ronaldo spends 3 days of holiday at Madeira with family and girlfriend, before headed back to Portugal national team on Wednesday. 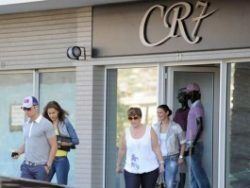 Before sightseeing, he took Irina to his store CR7 with mom Dolly and sis Katia. And afterwards, they both enjoying a nice view at Madeira island. Cris looks happy with his girlfriend by his side, showing her the first trip to his home town, Madeira. He even allowed a photographer, Helder Santos, took his pictures and Irina together.